The S 500 Plug-In Hybrid delivers 442 hp, can go 0 to 100 kph in 5.2 seconds and use as little as 2.8 liters of fuel per 100km. MALMO, Sweden -- Mercedes-Benz will roll out at least 10 new plug-in hybrid models by 2017 -- starting with its flagship sedan -- as the premium car manufacturer looks to fulfill strict carbon emission requirements in Europe. The new long-wheelbase S 500 Plug-In Hybrid that launches this month in Europe will be followed by a plug-in hybrid version of the midsize C class next year. Then Mercedes will roll out plug-in derivatives of other rear-wheel- and all-wheel-drive models including its SUVs, executives from parent Daimler told reporters on Sept. 19. “On average we will bring a new plug-in hybrid to market every four months,” said Johannes Reifenrath, head of product strategy and planning at Mercedes-Benz Cars. The model offensive represents the biggest commitment to plug-in power by a German premium brand to date. Audi plans to launch at least four plug-in hybrids, starting with the Audi A3 Sportback e-tron that is scheduled to arrive in showrooms this December. European legislators have mandated that Mercedes lower its car fleet emissions to 99 grams of CO2 per kilometer by 2020, which translates to 4.3 liters of fuel consumed per 100 kilometers. This would be a 26 percent decrease from its last year’s level of 134 grams and 5.4 liters, according to the company. “Obviously this will only happen if we continue to increase the proportion of electrified models, which is exactly what we are doing,” Reifenrath said. The S 500 plug-in will offer the performance of a V-8 with the consumption of a four-cylinder engine, according to Mercedes. Additionally, it will give motorists the option to drive emissions free for up to 33 kilometers when its 8.7 kilowatt hour lithium iron-phosphate battery is fully charged, which takes anywhere between two to four hours. The S class V-6 biturbo paired with an electric motor integrated into its seven-speed automatic transmission delivers 442 hp and 650 newton meters of torque, while being able to go from 0-100 kph in 5.2 seconds. At the same time the car needs 2.8 liters of fuel per 100km and emits only 65g/km of CO2. By comparison BMW’s most efficient flagship sedan, the ActiveHybrid 7 full hybrid, requires 6.8 liters of fuel per 100km and emits 158 g/km of CO2. BMW launched its first plug-in hybrid in June with the i8 sports car, which retails at 126,000 euros including VAT in Germany and has CO2 emissions of 49g/km. The X5 SUV is scheduled to get a plug-in variant in spring 2015 with more models featuring the powertrain slated to come. While BMW has not given a specific number, it has said it aims to offer a plug-in variant for each model line where it is economically sensible. Part of the savings from the S-class plug-in comes from its predictive energy management system that uses GPS data and radar sensors to calculate a route-based adaptive strategy for when to best drive electrically, use the combustion engine only, or both in combination. For example, it would deplete the battery as much as possible when going uphill in order to charge it on the way back down. The car would also try to ensure that the battery is fully charged when approaching a city so that it can drive emissions free in stop-and-go traffic with help from a next-generation braking system that recovers the kinetic energy. The car also features a haptic accelerator pedal that signals the driver via a double pulse to the foot when it is more efficient to let up on the gas pedal. Going forward, Mercedes promises even better fuel efficiency than the 65g/km of CO2 as battery capacity and performance improves toward its target range of at least 50km of emissions-free driving. “In combination with highly efficient gasoline and diesel engines and further optimized transmissions, we believe that certified CO2 figures of significantly less than 50 grams are achievable at the core of our vehicle fleet,” Reifenrath said. 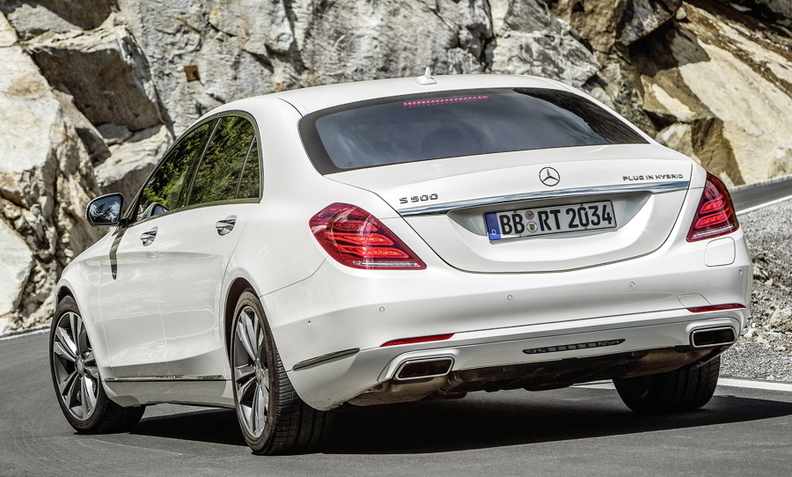 Mercedes’ current lineup of compact, front-wheel-drive cars will not be get plug-in derivatives, however. “We would have to change [the production process for] the body of the car,” Mercedes sales chief Ola Kallenius explained. Despite its additional technology, the S 500 Plug-In Hybrid is expected to retail in Germany starting at about 90,000 euros excluding value-added tax, roughly the same as a normal S 500 with a V-8 engine. “Pricing is derived from customers and not from costs,” Kallenius said, adding that he could imagine asking customers to pay more for a C-class plug-in variant when it hits markets next year. To quell any fears regarding the technology’s reliability, Mercedes will guarantee the battery and other plug-in components for six years or 100,000 kilometers. Instead of marketing the car as the upmarket sedan for environmentally friendly VIPs, Mercedes will promote the car using ads in Germany featuring its Formula One drivers, Lewis Hamilton and Nico Rosberg, to convey the message that the green car doesn’t require one to sacrifice performance, comfort and safety. “The S 500 Plug-In Hybrid is the vanguard of our plug-in initiative,” Kallenius said, adding that he expects the customers won’t be much different than those for the non-hybrid S class. The S 500 Plug-In Hybrid only will be available in the long-wheelbase version, because the stretched configuration currently accounts for roughly 90 percent of the 80,000 S classes sold since the model launched last July. The S 500 Plug-In Hybrid is slated to hit showrooms in the U.S. and China in March of next year.